A Trusted Friend: Rose Bud and other artwork by artist Thomas Kinkade can be viewed in our artist slideshow. A Trusted Friend: Rose Bud by artist Thomas Kinkade and other Thomas Kincade art, art work, artwork, canvases, giclees, images, limited editions, open editions, paintings, paper, pictures, posters, and prints can all be found at Christ-Centered Art. "Every childhood has its special friendships — and though youthful friends may come and go, a favorite doll or stuffed bear can become a lifelong companion. Even my oldest daughter, who recently passed the threshold into adulthood, still treasures several reminders of her happy childhood. These are so much more than just toys — they represent a moment in our life as a family. "My painting A Trusted Friend celebrates the imagination of childhood which can make even an inanimate object come to life with love. 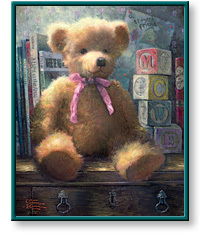 This is my first ever teddy bear painting, and as I worked on it, I was reminded of the passion displayed by teddy bear collectors worldwide." Add $100 to frame this canvas. A Trusted Friend: Rose Bud by artist Thomas Kinkade as well as other open and limited edition inspirational paper art prints and canvases, giclees, images, lithographs, paintings, pictures, posters, and reproductions by renowned Lightpost Publishing, Media Arts, and The Thomas Kinkade Company artist Thomas Kincade can be viewed and purchased at special sale prices at Christ-Centered Art.